Marjorie Cohn is a professor at Thomas Jefferson School of Law, past president of the National Lawyers Guild, and deputy secretary general of the International Association of Democratic Lawyers. Her most recent book is "Drones and Targeted Killing: Legal, Moral, and Geopolitical Issues." along a street in Sanaa, Yemen. November 9, 2013. President Barack Obama stood behind the podium and apologized for inadvertently killing two Western hostages - including one American - during a drone strike in Pakistan. "one of the things that sets America apart from many other nations, one of the things that makes us exceptional, is our willingness to confront squarely our imperfections and to learn from our mistakes." 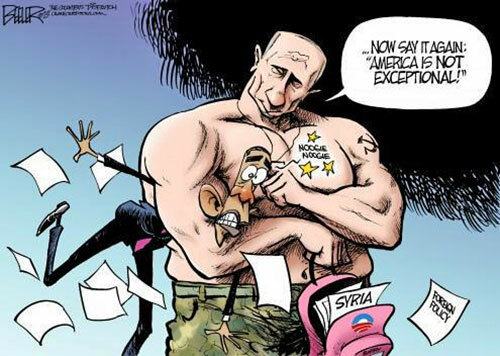 In his 2015 state of the union address, Obama described America as "exceptional." "Some may disagree, but I believe that America is exceptional." American exceptionalism reflects the belief that Americans are somehow "better" than everyone else. This view reared its head after the 2013 leak of a Department of Justice White Paper that describes circumstances under which the President can order the targeted killing of U.S. citizens. There had been little public concern in this country about drone strikes that killed people in other countries. But when it was revealed that U.S. citizens could be targeted, Americans were outraged. This motivated Senator Rand Paul to launch his 13-hour filibuster of John Brennan's nomination for CIA director. "Do the United States and its people really want to tell those of us who live in the rest of the world that our lives are not of the same value as yours?" (When I saw that letter, I immediately invited Archbishop Tutu to write the foreword to my book, "Drones and Targeted Killing: Legal, Moral, and Geopolitical Issues." He graciously agreed and he elaborates on that sentiment in the foreword). Obama insists that the CIA and the U.S. military are very careful to avoid civilian casualties. "before any strike is taken, there must be near-certainty that no civilians will be killed or injured - the highest standard we can set." Nevertheless, of the nearly 3,852 people killed by drone strikes, 476 have reportedly been civilians. The Open Society Justice Initiative (OSJI), which examined nine drone strikes in Yemen, concluded that civilians were killed in every one. "We've found evidence that President Obama's standard is not being met on the ground." In 2013, the administration released a fact sheet with an additional requirement that "capture is not feasible" before a targeted killing can be carried out. Yet the OSJI also questioned whether this rule is being followed. Suspected terrorist Mohanad Mahmoud Al Farekh, a U.S. citizen, was on the Pentagon's "kill list" but he was ultimately arrested by Pakistani security forces and will be tried in a U.S. federal court. "This is an example that capturing can be done," according to Micah Zenko of the Council on Foreign Relations. The fact sheet also specifies that in order to use lethal force, the target must pose a "continuing, imminent threat to U.S. persons." "clear evidence that a specific attack on U.S. persons and interests will take place in the immediate future." This renders the imminency requirement a nullity. Moreover, if there is such a low bar for targeting a citizen, query whether there is any bar at all for killing foreigners. There must also be "near certainty" that the terrorist target is present. Yet the CIA did not even know who it was slaying when the two hostages were killed. This was a "signature strike," that targets "suspicious compounds" in areas controlled by "militants." "most individuals killed are not on a kill list, and the [U.S.] government does not know their names." So how can one determine with any certainty that a target is present when the CIA is not even targeting individuals? Moreover, a panel with experienced specialists from both the George W. Bush and Bill Clinton administrations issued a 77-page report for the Stimson Center, a nonpartisan think tank, which found there was no indication that drone strikes had advanced "long-term U.S. security interests." Nevertheless, the Obama administration maintains a double standard for apologies to the families of drone victims. "The White House is setting a dangerous precedent - that if you are western and hit by accident we'll say we are sorry," said Reprieve attorney Alka Pradhan, "but we'll put up a stone wall of silence if you are a Yemeni or Pakistani civilian who lost an innocent loved one. Inconsistencies like this are seen around the world as hypocritical, and do the United States' image real harm." It is not just the U.S. image that is suffering. Drone strikes create more enemies of the United States. "When the drones hit, they don't see children." Americans are justifiably outraged when we hear about ISIS beheading western journalists. "People are a lot more comfortable with a Predator [drone] strike that kills many people than with a throat-slitting that kills one." But Americans don't see the images of the drone victims or hear the stories of their survivors. If we did, we might be more sympathetic to the damage our drone bombs are wreaking in our name. The guarantee of due process in the U.S. Constitution as well as in the International Covenant on Civil and Political Rights must be honored, not just in its breach. That means arrest and fair trial, not summary execution. What we really need is a complete reassessment of Obama's continuation of Bush's "war on terror." Until we overhaul our foreign policy and stop invading other countries, changing their regimes, occupying, torturing and indefinitely detaining their people, and uncritically supporting other countries that illegally occupy other peoples' lands, we will never be safe from terrorism. By the time Obama accepted the award, one year into his presidency, he had ordered more drone strikes than George W. Bush had authorized during his two presidential terms. The Obama administration has chosen to illegally assassinate them, often with the use of drones. The continued indefinite detention of men at Guantánamo belies Obama's pledge two days after his first inauguration to close the prison camp there. However, Obama has added only one detainee to the Guantánamo roster. In the signature strikes, sometimes called "crowd killings," the Obama administration often doesn't even know who are they killing. "But," write Jo Becker and Scott Shane in the New York Times, "some State Department officials have complained to the White House that the criteria used by the C.I.A. for identifying a terrorist 'signature' were too lax. Before taking the life of a person off the battlefield, the Due Process Clause of the U.S. Constitution 9 requires the government to arrest a suspect, inform him of the charges against him, and provide him with a fair trial. But like his predecessor, Obama defines virtually the entire world as a battlefield, ostensibly obviating the necessity to provide due process before execution. Obama has apparently adopted the same position, although he has replaced the moniker "War on Terror" with "War on Al Qaeda." This authorization is limited to groups and countries that supported the 9/11 attacks. But deterrence and preemption are exactly what Obama is trying to accomplish by sending robots to kill "suspected militants." Obama has extended his battlefield beyond Iraq and Afghanistan to Pakistan, Yemen, Somalia and Libya, even though the United States is not at war with those countries. U.S. drones fly from allied bases in Saudi Arabia, Turkey, Italy, Qatar, the Philippines and the United Arab Emirates. Armed drones are operated by "pilots" located thousands of miles from their targets. Before launching its payload, the drone hovers above the area. It emits a buzzing sound that terrorizes communities. "The drones were terrifying," observed New York Times journalist David Rhode, who was captured by the Taliban in Afghanistan in 2008 and later escaped. After the drone drops a bomb on its target, a second strike often bombs people rescuing the wounded from the first strike. Obama's administration has killed at least as many people in targeted killings as died on 9/11. "the vast majority were neither al-Qaeda nor Taliban leaders," CFR reported. Although more than 95 percent of all non-battlefield targeted killings have been carried out by drones, the killer robots are not the only medium used to conduct targeted killings. Drones are Obama's weapon of choice because, unlike piloted fighter aircraft, they don't jeopardize the lives of U.S. pilots. There are claims that the use of drones results in fewer civilian casualties than manned bombers. "In the United States, the dominant narrative about the use of drones in Pakistan is of a surgically precise and effective tool that makes the US safer by enabling 'targeted killing' of terrorists with minimal downsides or collateral impacts. Targeted killing with drones is counterproductive. Kurt Volker, former U.S. ambassador to NATO, concurs. "Drone strikes... do not solve our terrorist problem," he noted. Drone strikes breed increased resentment against the United States and lead to the recruitment of more terrorists. "Drones have replaced Guantánamo as the recruiting tool of choice for militants," according to Becker and Shane. "not to mention being counter-productive." "It means the rules of engagement have changed," a former CIA official with knowledge about special operations told the Los Angeles Times after the strike in Yemen. It wouldn't be the last. The drone industry doesn't like to refer to their killer robots as "drones" because of the negative connotation of these machines droning above communities. They prefer to call them Unmanned Aerial Vehicles (UAV) or Unmanned Aerial Systems (UAS). "is just the death penalty without due process," Clive Stafford Smith told the Guardian,40 is an example of American exceptionalism, reflecting the view that people in the United States are somehow superior to those in other countries. But in addition to the U.S. soldiers killed in Iraq and Afghanistan, hundreds of thousands of people in those countries have been killed and untold numbers wounded. And the four to six trillion dollars we spent on those wars could have been put to much better use in this country. Time columnist Joe Klein, considered by many to be a liberal, bought into American exceptionalism in a disturbing way in a 2012 interview by Joe Scarborough on MSNBC's Morning Joe. "You have four-year-old girls being blown to bits because we have a policy that says, 'You know what, instead of trying to go in, take the risk, get the terrorists out of hiding... we're just going to blow up everyone around them,'" and he mentioned "collateral damage." So it's preferable that foreign little girls get killed in order to protect American little girls? 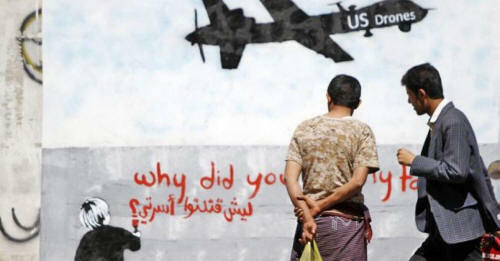 There had been little public concern in the United States about drone strikes killing people in other countries. But when it was revealed that U.S. citizens might be targeted, Americas were outraged. This was exemplified by Senator Rand Paul's 13-hour filibuster of John Brennan's nomination for CIA director. The Archbishop elaborates on that observation in the Foreword to this collection. "the United States is at war with al Qaeda, the Taliban, and their associated forces," without defining who those "associated forces" are. "America does not take strikes when we have the ability to capture individual terrorists - our preference is always to detain, interrogate and prosecute them." "capture, although our preference, was remote." Yet it was clear when the U.S. soldiers arrived at bin Laden's compound that the people there were unarmed and bin Laden could have been captured. "The cost to our relationship with Pakistan - and the backlash among the Pakistani public over encroachment on their territory - was so severe that we are now just beginning to rebuild this important partnership." In view of Pakistan's considerable arsenal of nuclear weapons, Obama took a substantial risk to our national security in breaching Pakistan's sovereignty by his assassination operation. As Obama delivered his remarks, the White House issued a Fact Sheet containing policies and procedures for counterterrorism operations,46 but did not release the full Presidential Policy Guidance. "The policy of the United States is not to use lethal force when it is feasible to capture a terrorist suspect." It provides that "lethal force will be used outside areas of active hostilities" only when certain preconditions are met. But it does not define "areas of active hostilities." A target must pose a "continuing, imminent threat to U.S. persons." The Fact Sheet does not define "continuing" or "imminent." "clear evidence that a specific attack on U.S. persons and interests will take place in the immediate future,"47 which renders the imminence requirement a nullity. There must be "near certainty" that the terrorist target is present, that noncombatants will not be injured or killed, and that capture is not "feasible" (left undefined). A showing must be made that governmental authorities in the target country cannot or will not effectively address the "threat to U.S. persons" (also left undefined), and no reasonable alternatives exist. A "legal basis" is required for the use of lethal force, but the Fact Sheet fails to define that legal basis. But the Fact Sheet would excuse these preconditions when the president takes action "in extraordinary circumstances" which are "both lawful and necessary to protect the United States or its allies." There is no definition of "extraordinary circumstances." The month before Obama gave his speech, McClatchy reported that the administration had been misrepresenting the types of groups and individuals it was targeting with drones in Afghanistan and Pakistan. "the CIA killed people who only were suspected, associated with, or who probably belonged to militant groups." Obama's claim of vast executive power to kill anyone he wants with no judicial involvement is precisely what the founding fathers feared when they wrote three co-equal branches of government into the Constitution to check and balance each other. Generals involved in the U.S. overseas drone program are being tapped by the Department of Homeland Security (DHS) to develop and direct our domestic drone program. "the increasing merger of the post-9/11 homeland security/border security complex with the military-industrial complex," in the words of Tom Barry,52 a senior policy analyst at the Center for International Policy. The Pentagon is slated to spend $5.78 billion in 2013 for research and procurement of drone systems, and DHS is spending millions of dollars in contracts with drone manufacturers, including General Atomics. This raises troubling issues regarding the morality and wisdom of our national priorities. Another disturbing issue is that the unlawful precedent the United States is setting with its use of killer drones and other forms of targeted killing not only undermines the rule of law. It also will prevent the United States from reasonably objecting when other countries that obtain drone technology develop "kill lists" of persons those countries believe represent threats to them. In this interdisciplinary collection, human rights and political activists, policy analysts, lawyers and legal scholars, a philosopher, a journalist and a sociologist examine different aspects of the U.S. policy of targeted killing with drones and other methods. These contributors explore legality, morality and geopolitical considerations, and evaluate the impact on relations between the United States and the countries affected by targeted killings. International legal scholar Richard Falk explains in Chapter Two why weaponized drones pose a greater threat than nuclear weapons to international law and world order. He notes that nuclear weapons have not been used since 1945 except for deterrence and coercive diplomacy as the countries of the world have established regimes of constraint on their use through arms control agreements and nonproliferation. Drones, however, are unconstrained by any system of regulation. They will likely remain unregulated as "the logic of dirty wars" continues to drive U.S. national security policy. In Chapter Three, policy analyst Phyllis Bennis describes assassination as central to U.S. war strategy due to the militarization of our foreign policy. She traces the program of assassination to the post-Vietnam era "Salvador option," in which CIA and Special Forces developed assassination teams and death squads to avoid American casualties. Moving into the modern era, Bennis details how the war strategy shifted from counter-insurgency, with large numbers of U.S. troops, to counter-terrorism and targeted killing, using drones as the preferred weapon. Chapter Four is an article published by journalist Jane Mayer in The New Yorker in 2009. This article was the first comprehensive exposé about the Obama administration's escalation of drone use for targeted killing. It is also one of the earliest efforts at documenting civilian casualties from the use of drones. Mayer raises the legal, political, and tactical ramifications of drone warfare and asks troubling questions about possible unintended consequences of this new weapon. In Chapter Five, sociology professor Tom Reifer examines America's embrace of a global assassination program using the Joint Special Operations Command and the CIA, which he calls "a paramilitary arm of the President." He focuses on the effects of drone strikes on persons and targeted communities, as well as the drone pilots themselves. Chapter Seven is a comprehensive report by Alice K. Ross, of the Bureau of Investigative Journalism, documenting civilian casualties of the drone strikes. She underlines the critical importance of publishing contemporaneous information on all casualties, civilian or militant, in a transparent, incident-by-incident manner -­ even where the information might be limited due to ongoing hostilities. Without such detail, Ross writes, it is impossible to effectively challenge casualty claims by officials and for victims of drone strikes to claim compensation. The United States' targeted killing through the use of drones and other methods violates international and U.S. law, human rights attorney Jeanne Mirer explains in Chapter Eight. Extrajudicial killing is not illegal in the context of a legally declared war on a battlefield. However, the United States wrongfully claims that "self-defense" gives it the right to execute anyone in any country, regardless of citizenship and regardless of the existence of a legal war. Mirer analyses how the United States is violating International Human Rights Law and International Humanitarian Law. In Chapter Nine, philosopher Harry van der Linden analyzes whether targeted killing by drones in non-battlefield zones can be justified on the basis of just war theory, applying traditional jus ad bellum (justice in resort to war) and jus in bello (justice in execution of war) principles. He asks if proliferation and expansion of combat drones in war will be an obstacle to initiating or executing wars in a just manner in the future, utilizing principles of "just military preparedness" or jus ante bellum (justice before war), a new category of just war thinking. Van der Linden concludes that an international ban on weaponizing drones is morally imperative and, at a minimum, that an international treaty against autonomous lethal weapons should be adopted. In Chapter Ten, Center for Constitutional Rights attorney Pardiss Kebriaei discusses the first legal challenge to the U.S. targeted killing program in Al-Aulaqi v. Obama. That case involved the Obama administration's authorization of the targeted killing of a U.S. citizen in Yemen. She cites the imperative for accountability, including through judicial review, and discusses the obstacles constructed by the Obama administration that have effectively precluded judicial review thus far. "day-to-day acts of Israeli state-terror and repression." He wonders how extrajudicial execution became official Israeli policy since Israel does not have the death penalty. Menuchin examines assassination petitions filed in the Israeli High Court of Justice, including the "Targeted Killing" case, PCATI v. Government of Israel, and he laments Israel's lack of accountability. Legal scholar John Quigley analyzes in Chapter Twelve the impact of the policy of using lethal pilotless aircraft on relations between the United States and the countries in which the affected populations are located, in the context of a history of resentment against U.S. interventions and interference. He suggests that the policy redounds to the detriment of the United States by engendering resentment and the use of violence against the United States and its personnel. The chapter suggests that the Obama Administration is aware of these risks but continues its policy in spite of them. In Chapter Thirteen, ACLU attorney Jay Stanley discusses policy issues surrounding the imminent arrival of domestic drones in U.S. airspace. The main concern is privacy. Stanley asks how the technology is likely to evolve, and how the First Amendment "right to photography" interacts with serious privacy issues implicated by drones. The national discourse about drone deployment has opened up a space for privacy activists and others to create a genuine public discussion of the issue before it is widely deployed. Finally, in Chapter Fourteen, political activist Tom Hayden places the advent of the Drone Age into a historical context of U.S. military invasions and occupations. "in grave danger of leaving a new Imperial Presidency as his legacy." Hayden advocates a transparent set of policies to rein in the use of drones and cyber warfare, while protecting democracy. Drones and targeted killing will not solve the problem of terrorism. "If you use the drone and the selected killings, and do nothing else on the other side, then you get rid of individuals. But the root causes are still there," former Somali foreign minister, Ismail Mahmoud 'Buubaa' Hurre, told Scahill. "Muslims do not 'hate our freedom,' but rather, they hate our policies." "American direct intervention in the Muslim world," through the U.S.'s "one sided support in favor of Israel," support for Islamic tyrannical regimes in Egypt and Saudi Arabia, and, primarily, "the American occupation of Iraq and Afghanistan." "paradoxically elevate the stature of and support for Islamic radicals." Becker and Shane sounded an alarm about the ramifications of drone strikes on the future of U.S. relations with Muslim countries. We ignore this admonition at our peril. Until we stop invading countries with Muslim populations, occupying their lands, torturing their people, and killing them with drones, we will never be safe from terrorism. 1 Barack Obama, President, United States, Remarks by the President at the Acceptance of the Nobel Peace Prize (Dec. 10, 2009), available at www.whitehouse.gov/the-press-office/remarks-president-acceptance-nobel-peace- prize. 2 See generally, THE UNITED STATES AND TORTURE: INTERROGATION, INCARCERATION, AND ABUSE (Marjorie Cohn, ed., NYU Press 2011). 3 Dan Roberts, US drone strikes being used as alternative to Guantanamo, lawyer says, GUARDIAN (May 2, 2013), www.theguardian.com/world/2013/may/02/us- drone-strikes-guantanamo. 4 Jo Becker & Scott Shane, Secret 'Kill List'Proves a Test of Obama's Principles and Will, N. Y.TIMES (May 29, 2012), www.nytimes.eom/2012/05/29/world/obamas- leadership-in-war-on-al-qaeda.html?pagewanted=all. 6 Jack Serle & Chris Woods, Secret US documents show Brennan's 'no civilian drone deaths' claim was false, BUREAU OF INVESTIGATIVE JOURNALISM (Apr. 11, 2013), www.thebureauinvestigates.com/blog/2013/04/ll/secret-us-documents-show- brennans-no-civilian-drone-deaths-claim-was-false/. 7 Becker & Shane, supra note 4. 9 U.S. CONST, amend. V.
11 "War on Terror" is a misnomer as terrorism is a tactic, not an enemy. A country cannot declare war on a tactic. 12 See Leila Nadya Sadat, America's Drone Wars, 45 Case W. Res. J. Int'l L. 215, 221 (2012). 13 Paul R. Pillar, The Limitless Global War, THE NATIONAL INTEREST (June 19, 2012), nationalinterest.org/blog/paul-pillar/the-limitless-global-war-7094. 14 Authorization for Use of Military Force, 115 Stat 2 24 (2001) (emphasis added). 15 Bruce Ackerman, President Obama: Don't go there, WASH. POST (Apr. 20, 2012), articles.washingtonpost.com/2012-04-20/opinions/35452574_l_terrorist-group- terrorist-attacks-terrorist-threat. 16 Craig Whitlock, Drone base in Niger gives U.S. a strategic foothold in West Africa, WASH. POST (Mar. 21, 2013), articles.washingtonpost.com/2013-03- 21/world/37905284_l_drone-bases-unarmed-predator-drones-surveillance- drones. 17 David Rhode, The Drone War, REUTERS (Jan. 26, 2012), www.reuters.com/article/2012/01/26/us-davos-reutersmagazine-dronewar- idUSTRE80P19R2 0120126. 18 Micah Zenko, Reforming U.S. Drone Strike Policies, Council Special Report No. 65, COUNCIL on FOREIGN RELATIONS CENTER 14 (Jan. 2013), i.cfr.org/content/publications/attachments/Drones_CSR65.pdf. 19 Zenko, supra note 18, at 10. 22 Stanford Law Sch.& New York Univ. Sch. of Law, Living Under Drones: Death Injury, and Trauma to Civilians from US Drone Practices in Pakistan v (2012), available at www.livmgunderdrones.org/wp-content/uploads/2012/10/Stanford- NYU-LIVING-UNDER-DRONES.pdf. 23 Zenko, supra note 18, at 12. 25 Kurt Volker, What the U.S. risks by relying on drones, WASH. POST (Oct. 26, 2012), www.washingtonpost.com/opinions/we-need-a-rule-book-for-drones/2012/10/2 6/957312ae-lf8d-lle2-9cd5-b55c38388962_story.html. 26 See JEREMY SCAHILL, DIRTY WARS 465-466 (Nation Books 2013). 27 Zenko, supra note 18, at 11. 28 Becker & Shane, supra note 4. 29 Common Dreams staff, Common Dreams, UN Investigator Blasts US Drone Program June 19, 2012), www.commondreams.org/headline/2012/06/19-0. 30 Daniel Mullen, Pakistan court declares US drone strikes illegal, JURIST (May 9, 2013), jurist.org/paperchase/2013/05/pakistan-court-declares-drone-strikes-illegal-directs-foreign-ministry-to-introduce-resolution-in-un.php. 31 Scahill, supra note 26, at 75-77. 32 Greg Miller & Josh Meyer, CIA Missile in Yemen Kills 6 Terror Suspects, Los ANGELES TIMES (NOV. 5, 2002), artides.latimes.eom/2002/nov/05/world/fg-yemen05/2. 33 Scahill, supra note 26 at 177. 37 See NICK TURSE &TOM ENGELHARDT, TERMINATOR PLANET: THE FIRST HISTORY OF DRONE WARFARE 2001-2050 9 (2012). 38 Id. at 10, 74. 41 Barack Obama, President, United States, Obama's Speech at the U.N. (Sept. 24, 2013), available at www.nytimes.com/2013/09/25/us/politics/text-of-obamas- speech-at-the-un.html?pagewanted=all&_r=0. 42 Peter Hart, Morning Joe's Drone Debate: Whose Four-Year-Old Girls Should be Killed?, FAIR (Oct. 23, 2012), www.fair.org/blog/2012/10/23/morning-joes-drone- debate-whose-four-year-old-girls-should-be-killed/. 44 Desmond M. Tutu, Drones, Kill Lists and Machiavelli, N. Y. TIMES (Feb. 12, 2013), www.nytimes.com/2013/02/13/opinion/drones-kill-lists-and- machiavelli.html?_r=0. 45 Barack Obama, President, United States, Remarks by the President at the National Defense University (May 23, 2013), available at www.whitehouse.gov/the-press- office/2013/05/23/remarks-president-national-defense-university. 46 Office of the Press Secretary, Fact Sheet: U.S. Policy Standards and Procedures for the Use of Force in Counterterrorism Operations Outside the United States and Areas of Active Hostilities, WHITE HOUSE (May 23, 2013), www.whitehouse.gov/the-press- office/2013/05/23/fact-sheet-us-policy-standards-and-procedures-use-force- counterterrorism; see Appendix B. 47 See White Paper, supra note 43. 51 The Constitutional and Counterterrorism Implications of Targeted Killing: Hearing Before the Senate Judiciary Subcomm. on the Constitution, Civil Rights, and Human Rights of the S. Comm, on the Judiciary, 113th Cong. 19-20 (Apr. 23, 2013), www.judiciary.senate.gov/pdf/04-23-13 BrooksTestimony.pdf. 52 Tom Barry, Homeland Security Taps Generals to Run Domestic Drone Program: The Rise of Predators at Home, TRUTHOUT (Aug. 7, 2013), www.truth-out.org/news/item/17995-homeland-security-taps-generals-to-run-domestic-drone-program-the-rise-of-predators-at-home. 54 Scahill, supra note 26, at 494. 55Glenn Greenwald. A Rumsfeld-era reminder about what causes Terrorism. SALON (Oct. 20, 2009), www.salon.com/2009/10/20/terrorism_6/. 56 Becker & Shane, supra note 4.